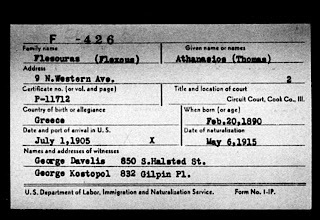 I want to state at the beginning of this post that I have put this information together on two of the Flesouras/Fleseras/Flesor (the three spellings show the progression of the Americanization of the Greek name) brothers and the two businesses that they started, based on documents, newspaper articles and my own analysis. I have only been able to talk with one living Flesor to get a few pieces of information. I hope that the present Flesor owners of each of the Ice Cream/Candy Stores will correct any errors. 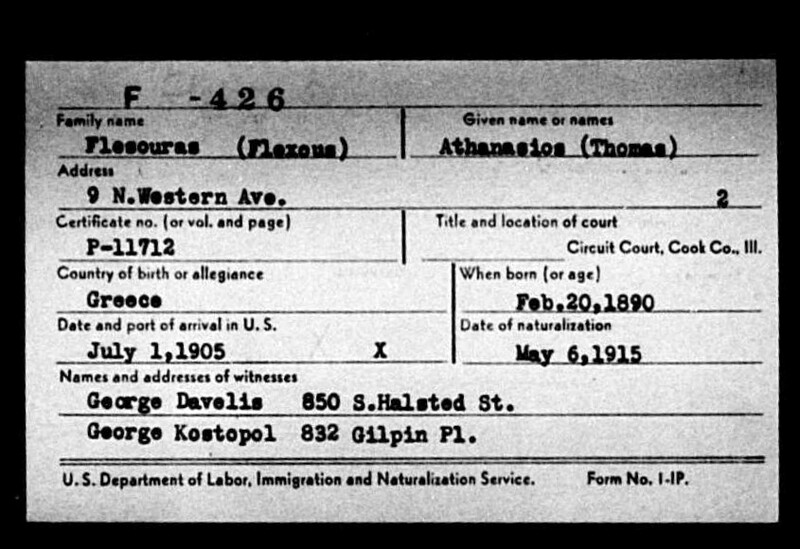 My two ancestors, Athanasios (Tom) and Constantin (Gus) Flesouras/Fleseras/Flesor also followed a common path from peddler and sidewalk vendor to store owner that Greeks were known to do in early nineteenth century Chicago as described by Irving Cutler. 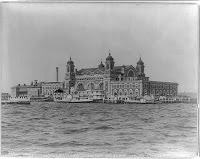 Tom and Gus Flesouras were examples of their fellow Greek immigrants to America who came from very small villages and had very little money when they arrived. They often came in family groups – in this case Tom and Gus came with three other brothers. 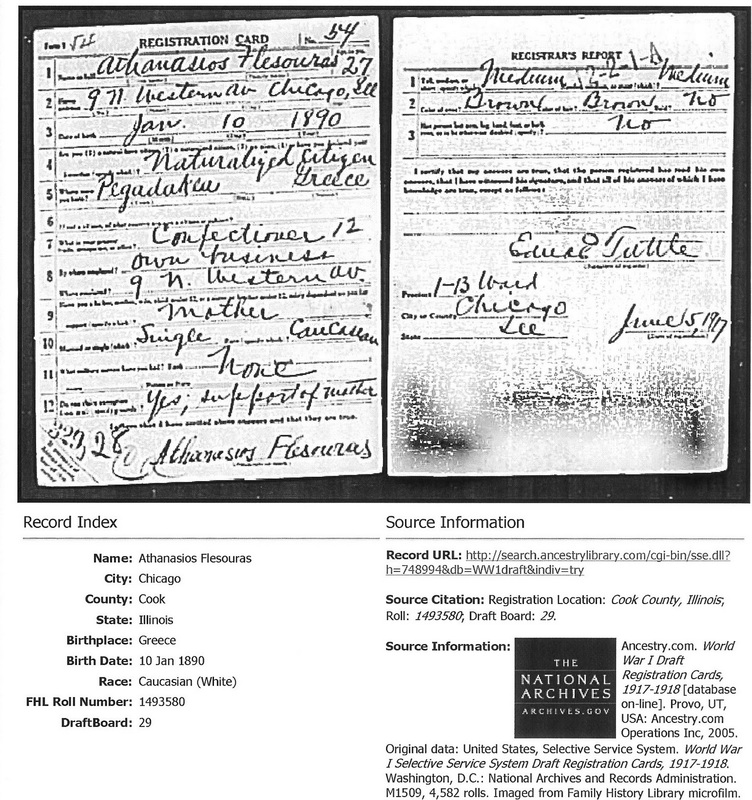 In the 1900 Chicago Federal Census, Tom, Gus, George, and Peter Fleseras (my great grandfather) were all living in the same household. At least two of them, Gus and Tom, were on their way to becoming small business owners in the specialty area of confection. Gus (scroll down to p. 119 on Tuscola Businesses webpage) started his ice cream shop and candy store, the Flesor Candy Kitchen, in Tuscola, IL in 1901. He built the business into a mainstay of downtown Tuscola. Many people today have fond memories of childhood visits to the Candy Kitchen. When Gus decided it was time to step down in 1969, his son, Paul Flesor, took over the business and managed it until he retired in the 1970s. Sadly, the Flesor Candy Kitchen became a memory and the building became run-down. But luckily for all the candy and ice cream lovers of the world, Gus’s two granddaughters, Ann Flesor Beck and Devon Flesor Nau, bought the building in 2003 and ressurrected Flesor Candy Kitchen in all its glory. While Gus chose to move out of Chicago to start his business, brother Tom remained in Chicago. It took him a little longer to start his business, but by 1915 he owned Gayety’s Chocolates and Ice Cream Company (see the history tab) in South Chicago. 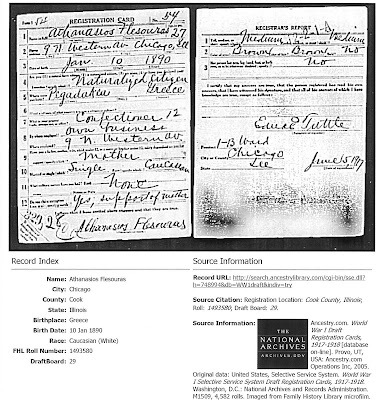 Tom's WWI draft registration card and his naturalization record show his business status. Tom managed this Chicago landmark confectionary until he retired in the 1930s and his son, Elias/Leo/Lee Flesor took over. In 1987, Lee decided it was time to move the Gayety outside of Chicago. 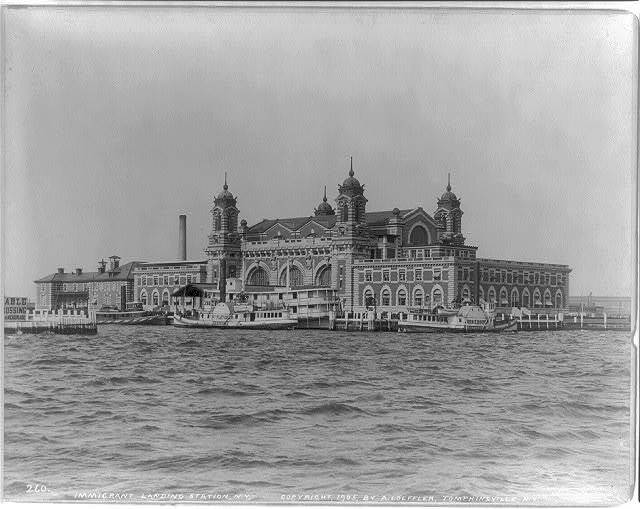 He chose Lansing, IL as the new home of the historic Chicago company. In 2012, Lee is still coming into the business everyday but his son, Jim Flesor and Jim’s wife Beth, now run Gayety’s. Before I started learning about my family history, I used to lament that we had no business owners in our family. How wonderful now to find the Flesor Dynasty of ice cream and candy makers. It’s all in the genes!